There is good practice and positive customer experience in this area – with significantly increasing registration numbers and corresponding uptake of non-financial support services in parts of some sectors – particularly energy. 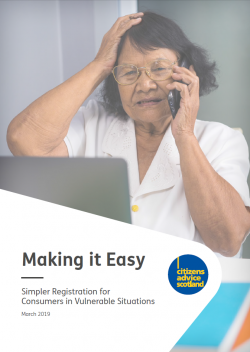 However there is not yet an integrated approach between essential service providers and the public sector, in ensuring that all those eligible and wishing to receive additional support are aware of registration, or of the services available, and that numbers registered are maximised. Identifying and engaging with consumers in vulnerable situations. The report also makes short and medium term sector specific recommendations to energy companies, Scottish Water, Ofgem, Scottish Government and the UK Government. A dedicated public/private sector working group should be convened to drive forward simpler registration for consumers in vulnerable situations, and to co-ordinate a number of strands of the other separate recommendations. Such a working group could also consider developing possible long-term solutions for an integrated registration process, or portal, and possibly a universal annual registration scheme offering consumers added control of their data.